The team at Banbury Postiche is passionate about Research & Development – continually developing and improving the hair loss solutions that can be offered, to ensure that you benefit from the ultimate in Custom Made Wigs and Hairpieces. The teams is at the forefront of the Wigmaking industry and use the very latest materials to produce the finest wig bases with options to suit clients with total hair loss and those with partial hair loss. When we combine our superior custom made wig base technology with our outstanding quality hair you will truly have the ultimate custom made wig or hairpiece and will wonder why you have never worn our custom made wigs before. 1. 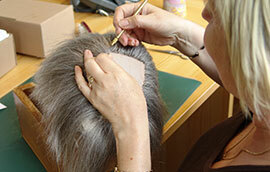 Elite Custom Made Wig Base - This base offers the wig wearer the feeling of “having their own hair”. 2. Paris Custom Made Wig Base - Made of super fine monofilament, with a fantastic Glass Fibre Nettting structure and discrete PU. 3. Venice Custom Made Wig Base - Ultra-lightweight - gives the appearance of naturally grown hair. 4. 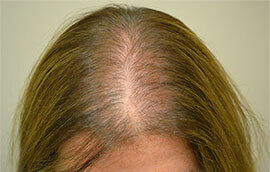 Grace Custom Made Wig Base - Constructed using super fine monofilament and micro monofilament materials. We offer a superb maintenance service where our specially trained team of seamstresses can repair and adjust your wig to extend its life, (subject to inspection). Our on-site specialist hairdressing team can clean and style your custom made wig or hairpiece for you to ensure that it is kept in tip top condition or you can use our specialist real hair wig products to look after your wig or hairpiece at home.